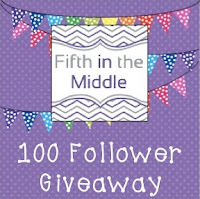 Diane at Fifth in the Middle is going to knock your socks off with her 100 follower giveaway - there's a little of everything from teaching resources to giftcards to THAT amazing pencil sharpener we all have grown to love. Drop by, enter & share! Holly at Fourth Grade Flipper is having an amazing 300 follower giveaway! 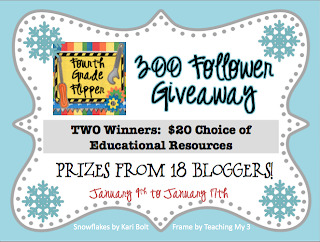 In fact, it's so amazing that she has broken it down into a primary and an intermediate giveaway - woohoo! Something for EVERYONE...what are you waiting for? Enter now! And, while you're hopping, I have today's featured blogger! You do not want to miss out on this blog. 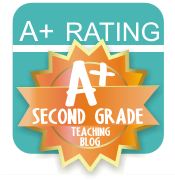 Rhiannon is a first grade teacher who just started blogging in October. Remember when you first started blogging and wondered if anyone was really reading your posts? It can get very discouraging. Let's see if the Budding Blogger Showcase can help her build her audience! Hop over to read her latest post about a new AWESOME product she is using from Lakeshore Learning (oh, how those little babies would have saved me some time last summer! )...and she has a freebie for ya, too! If you hop over to take a look, leave her a comment (and a follow) so she'll know you dropped by! Hi! I'm Rhiannon Jolliff and I recently joined the blogging world. My blog is called Sliding Into First, combining my loves of teaching and baseball! About Me: I live in Northwest Indiana, about 35 miles from Chicago. I am a Cubs FANATIC and have season tickets after being on the waiting list for 10 years! In addition to the Cubs, my other interests are shopping (it's a huge problem), movies, and hanging out in the sun, swimming, rollerblading, or just laying on the beach or poolside! I also love just about anything Disney and can't wait to finally see the Fantasyland expansion over spring break! I have been teaching first grade for 9 years now and I feel so lucky to have been hired into the perfect grade for me at the perfect school! My favorite subject to teach depends on the day, but teaching first graders to read is probably the most gratifying thing about my job. If you popped into my room unannounced, you may see kids up singing and dancing to music (we love Harry Kindergarten songs), or spread around the room at Daily 5 rotations, reading on Nooks or listening to books on iPods. You may see lots of collaborating, whether it is on the rug or at their tables- we are always talking! What gets me through one of those days? Well, that one is easy- the kids! Even at their most frustrating moments, they are truly excited to learn. They are also always full of compliments and genuine love for their teacher, along with some super cute smiles. They always know how to make me smile and laugh, no matter how trying the day may be. When I am stressed out about planning, grading, or whatever else may come up, they always make it more than worth it! The parents get me through, too. I have the most amazing parent volunteers that come in and help, email, donate supplies, send snack, do organizing or pencil sharpening for us at home, or anything else I may need. One "can't live without" teaching resource I have is Reading A-Z.com. I use their books to study phonics rules, science concepts, and of course, reading skills. I've posted about it a lot on my blog and will probably continue to do so because I use this site daily! One of my favorite classroom activities would be using snacks to help with math concepts. This year we made arithmetic racks using Twizzler Pull N Peels and Apple Jacks. Parents also donated Teddy Grahams that we're going to use for non-standard measurment, as well as more Pull N Peels! We also have marshmallows and toothpicks to make plane shapes and 3D shapes. Another thing I like to do is use transition time as learning time! We do brain breaks between activities by playing math music videos or by doing PowerPoint games with sight words or nonsense words. Transition times used to be a huge downfall of mine, but these tools have really helped! One of my blogging goals this year is to make new friends by networking and joining blogs, as well as having people join mine. I would love to have feedback on my posts and collaborate with teachers all over the country! 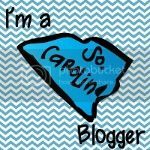 I hope you check out my blog and leave me a comment so I can follow you! I love to learn from others! Yay! I love finding new teaching blogs to follow! 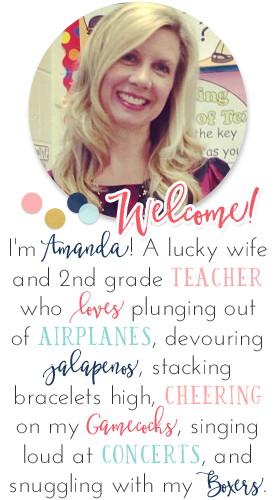 Thanks for the shout out Amanda! You're the best! I love this showcase. Fifth in the Middle is one of my favorites. Diane is the business! Hopping over to check out Sliding into First. Yay!! Thank you so much for the shout out and helping with my giveaway!! I appreciate it so much!